Families and classrooms familiar with the traditional counting song “Over in the Meadow” will love trying out this creative version that can be read or sung. 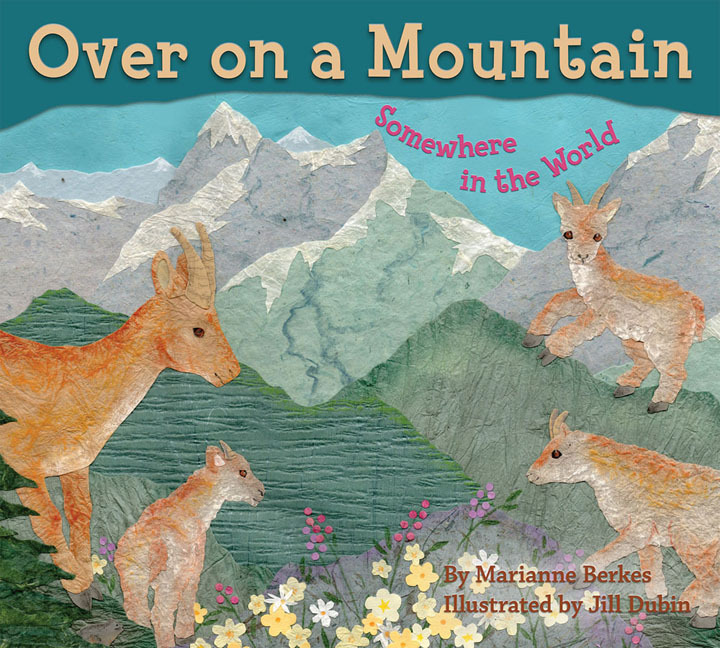 Author and educator Marianne Berkes has several versions on this theme, and Over on a Mountain is a beautiful and worthy addition to the collection. With emphasis on the names of different animal children (cria, eaglet, kid, joey), Marianne Berkes and Illustrator Jill Dubin work together to create a marvelous world of mountains that span all seven continents. The cut-paper collages are colorful and detailed, and they reflect the counting rhymes on each page as the counting animals huddle, soar, and leap. Maps on each page show in which mountain range the animals live. Marianne Berkes also provides informative and fun details about each of the animals featured across the six continents. Showing her education background, the author also provides tips on discovering more about the animals and places, including visiting zoos, using Venn Diagrams to compare and contrast, and pretending to be the different animals as part of a guessing game. An added bonus, each page has a hidden visual surprise, and at the end of the book, the “tips from the illustrator” section instructs readers how to make their own cut-paper art.